Imagine another Earth  similar to ours, yet altogether different  set in a time period reflecting the golden age of air travel. Put in a handful of characters from one of Walt Disney's animated classics and give them new lives; add a generous helping of never-before-seen people, places, and things; blend humor and drama in equal parts; cram in as much fun and adventure as you can, adding a dash of danger and a healthy dose of heart-filled storytelling. You now have the formula for what is an unsung highlight of animated television  a series which many consider to be the finest the Disney Company ever released. TaleSpin, a spin-off loosely based on Walt Disney's 1967 adaptation of The Jungle Book, stars Baloo Bear as an ace pilot from the harbor city of Cape Suzette, in a fantasy world whose citizens are clothed, talking animal-people. The fuzzy, fun-loving bear and his new best buddy, navigator Kit Cloudkicker, fly deliveries for an air cargo company called "Higher for Hire" run by Rebecca Cunningham, sharp businesswoman and caring mother of young daughter Molly. Their compatriots include the singing orangutan Louie, now the proud manager of a swinging island nightclub, and also Higher for Hire's trusty, rust-brained mechanic Wildcat. Aboard the fabulous airplane the Sea Duck, these "friends for life" travel to distant places, finding high-flying action and adventure (or rather, it finds them) as they run afoul of adversaries such as Don Karnage, egomaniacal leader of the dreaded Air Pirates; Shere Khan, CEO of the largest corporation in the world, Khan Industries; and Colonel Spigot, tyrannical commander from the frozen, communist country of Thembria. Through thick and thin, the heroes learn valuable lessons on courage, honesty, and friendship, always winning as they team up to turn things around on troublemakers. TaleSpin officially debuted on syndicated television on September 9, 1990, with the premiere of its introductory TV-movie "Plunder & Lightning." Fans since justifiably view the series as the pinnacle of the Disney Afternoon's program lineup, as well as one of the best shows (animated or otherwise) of its decade. 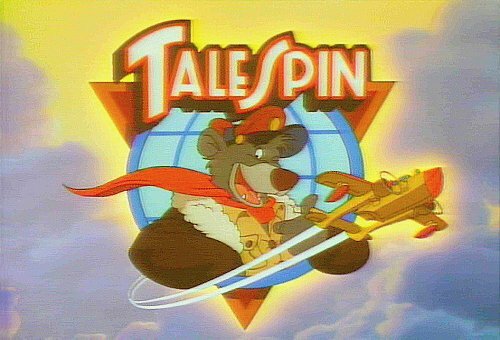 In spite of critical praise (best embodied by the Emmy Award won by "Plunder & Lightning" and an Emmy nomination for all 65 episodes), TaleSpin seemed undeservedly downplayed by its parent company. Yet its quality has earned the appreciation of many who seek to preserve this special series for generations to come. The TaleSpin Sourcepage strives to be what Disney never published: a reference that organizes information, details, facts, and trivia into a cohesive whole, providing an in-depth and comprehensive look inside the TaleSpin saga. Rather than supplying episode lists and strings of statistics, the Sourcepage presents the world of TaleSpin from the show's own perspective, familiarizing readers with this fictional setting. The ultimate goal is to enjoy its richness and texture, and admire the imagination and creative labor that went into designing it. To maintain continuity and avoid discrepancies, the Sourcepage describes things after the events of the series have taken place and exclusively covers the 65 episodes constituting TaleSpin canon. TaleSpin comic books are not dealt with, although pertinent material from them and other merchandise does appear. This keeps page articles as true to the TaleSpin series as possible while exploring concepts as far as what available facts imply. Submissions from fan writers are featured also, as supplements to related topics; they are noted wherever used. Packed with descriptions, explanations, and illustrations, the TaleSpin Sourcepage serves as a guide to an amazing world filled with intriguing locations, dazzling aircraft, breathtaking cities, fantastical technology, unusual creatures, and entertaining characters. So put on your flight cap, pull chocks, and take off for the wild blue yonder  there's nothing but clear skies ahead . . . Throughout the TaleSpin Sourcepage you will find inset boxes such as this, some large and some small. These insets, wherever they are found, will contain additional information related to a topic. Because these side notes may develop into a profile within a profile, they are separated from the main text for easier reading. Readers will notice a box following the end of each character or vehicle profile, with a list of figures such as "2D" or "3D+2" in various categories. These numbers, known as die codes, are based on the classic "D6" system published by West End Games. The die codes presented with each vehicle and character serve as an abstract way to measure and compare important qualities and attributes. What's more, game enthusiasts will find these codes fully compatible with West End's systems and may use them to run their own TaleSpin-themed adventures. Many thanks to Steven Ganske (aka "Starkweather") for the essays he contributed. Thanks also go to Geary Graham, author of one of the earliest works of TaleSpin fan fiction  now featured on the TaleSpin Sourcepage for all to enjoy. Thanks to members of the TaleSpin fandom for their ideas and contributions, credited wherever used. Most of all, many thanks to Jymn Magon, supervising producer of TaleSpin. Besides his introduction of the term "Usland" to the TaleSpin lexicon years after the show ended, Jymn's insights have been invaluable in better appreciating this wonderful series. To Jymn Magon and co-producer Mark Zaslove, to the writers and story editors, the voice actors, the animation artists, to composer Christopher L. Stone, to everyone involved in the making of TaleSpin  and to fans everywhere  the TaleSpin Sourcepage is dedicated. TaleSpin, Copyright 1990/1991 Walt Disney Company. Material used without permission for non-profit purposes only.